I recently addressed a particular detractor of the Islamic obligation for Muslims to be politically united under a Caliphate. 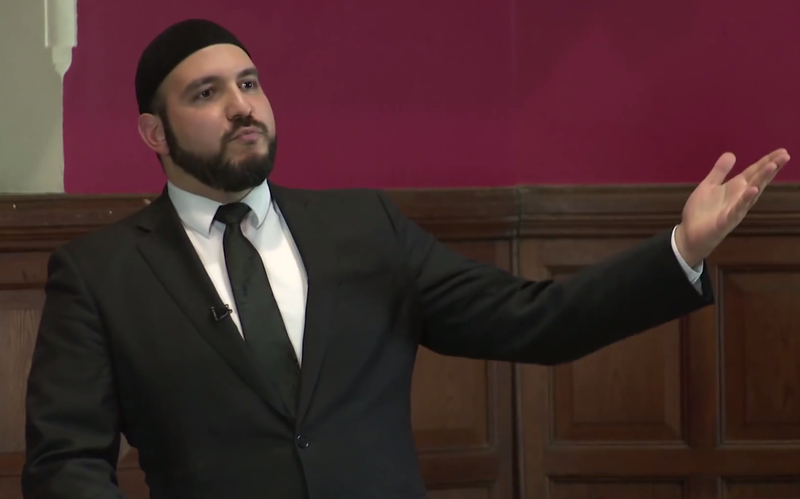 ‘Mufti Abu Layth’ [or ‘MAL’ for brevity] preaches that belief in the Caliphate is a ‘cancerous ideology’, an ‘erroneous view’, and is even a form of ‘hate speech’. As part of a supposed “#CallEmOut” and “#ReclaimIslam” campaign, he urged his readers to, in effect, witch-hunt anyone who professes this belief. The obligation of a Caliphate, throughout history, has been a belief of near complete consensus in Islamic scholarship. So, describing the belief in a Caliphate as an ‘erroneous view’ raises serious red flags. MAL isn’t alone in arguing this; Secularists (or ‘reformists’) have been known to advocate a cynical view of Muslim history in an attempt to claim that the Islamic concept of a Caliphate that unites Muslims, implements Sharia and pursues Islamic interests, is somehow a ‘modern concept’ not practiced or believed by Muslims throughout history. I had responded by pointing to simple and clear evidences from one of the most regarded classical Islamic scholars – Imam Ghazali. MAL then wrote an article claiming that Imam Ghazali had been ‘hijacked’ and did not intend the obvious meanings of the statements of his that I quoted. MAL tries to describe the context around the quotes I used from Ghazali’s book, ‘Mustazhiri’, by portraying the Muslim world as having no overall leader: ‘since within the first century after the Prophets lifetime, Muslims have never had one leader and always had different kingdoms led by dynasts and kings, with countless people all calling themselves Caliph’. At the time of Ghazali writing the book Mustazhiri, the Abbasid Caliph al-Mustazhir was appointed as Imam/Caliph in 1094, and with the exception of Egypt (controlled by the rebel Fatimid faction), a Muslim could travel from Lisbon to Lahore (or to Kashgar in China) and never leave the lands under the banner of the Abbasid Caliphate. Unfortunately it seems as if MAL is unaware of the Republic of San Marino, the Republic of Amalfi, the Republic of Venice, the Icelandic commonwealth, the Republic of Florence, and the Republic of Genoa, all governments that existed in the world at the time of Imam Ghazali’s life, who were officially republics (or communes) with elected officials and varying degrees of public ‘representation’ (whatever that means) – but this error is a small issue. The claim that there was no police force in Imam Ghazali’s time is not only misinformed, but would be startling news to Mujahid al-Din Bihruz, who as Baghdad’s chief of police around the time of Ghazali’s life, would no doubt be surprised to hear that his job didn’t exist! Since the time of Ali (ra) the Islamic Caliphate had long instituted the shurtat al khamis, who was tasked with keeping order in cities, investigating crimes prior to trial, and discharging the orders of the Islamic court system. MAL’s portrayal of the medieval european and Muslim world is simply inaccurate and unfortunately closer to hollywood than actual history. The Islamic concept of Caliphate was one where a Caliph ruled and implemented Sharia. For practical reasons, each region had a governor and judges appointed by the Caliph, who acted as his deputies in both executive roles and judicial roles respectively. By Ghazali’s time, the regional governors acted virtually autonomously, but despite being called ‘malik’ (king) or ‘sultan’ (leader), under Islamic law, they were only considered a ‘deputy of the Abbasid Caliph’ whose legitimacy relied upon the formal appointment by the Abbasid Caliph himself (called ‘investiture’) and whose lands were considered to be one land, with no borders between the different governor jurisdictions. As will be seen below, Ghazali certainly views the Muslim world as described. MAL writes: ’Imam ghazali concludes [i.e. in his book ‘Mustazhiri’] that therefore Al­Mustazhir is the true Caliph which all people must give an allegiance to. It would be absurd to assume by all people he was calling all the people in the World at the time in Muslim Europe, Africa and Asia etc since that would be only a fantasy! He however was simply addressing the people who were the Abbasid Kings subjects’. If every region can have a Caliph/Imam, as MAL suggests, why does Ghazali argue that the Fatimid leader in Egypt is not the true Imam because the majority of Muslims (worldwide) support the Abbasid Caliph? Why were the Fatimids and Abbasids fighting each other, while denouncing each other’s leaders as ‘not the true Imam’ if Ghazali understood that each region could have their own Imam? The reason is, as it becomes painfully clear to the reader of the book, that Ghazali undoubtedly believed Caliph Mustazhir to be Imam of all the Muslims and leader of all Muslim lands, and therefore they could be only one. Therefore, when Ghazali writes ‘the Imam charged with the truth whom all Men are bound to obey in this age of ours is the Imam al-Mustazhir billah’ and ‘all the ulema of the time must give the legal decision that men are definitely and positively bound to obey him…and that he is the Caliph of God over men, and that obedience to him is a duty incumbent on all men’, we would do well to take him at his word. Perhaps MAL was honestly misinformed about this matter and will concede the error, as it would be hard to imagine that anyone could persist in denying as ‘fantasy’ the obvious intent of Imam Ghazali’s words about this matter without, I fear, requiring levels of mental gymnastics perhaps worthy of entry into the Olympics. I’m sure Ghazali would appreciate the irony that Muslims after him, who wish to deny the Islamic hukm (rule) regarding Imamate, would reject the literal meaning of his book, when that book was written to refute the Batiniyyah – the very people who reject the literal meaning of the Quran and Sunnah because they wish to deny Islamic rulings (akham). Plus ça change. What, if anything, does MAL believe the purpose of writing these books was? Ghazali wrote ‘Al Mustazhiri’ evidently with the intention for it to be copied and disseminated amongst the Muslims of his time in order to not just refute the Fatimid propaganda against the Abbasid Caliph, but to ultimately bring the Fatimid peoples under the Abbasid Caliph as the only true Imamate for the Ummah. This safely meets the dictionary definition of ‘rallying’. Ghazali also detailed how he actively lobbied for support for Yusuf bin Tashfin’s cause, both at the Caliph’s court, and throughout the Muslim lands. Well, there already was a group that was successfully uniting the Muslim world – the Seljuks. The Seljuks proclaimed that they were working to unite the Ummah under the Abbasid Caliph and Ghazali was one of their key advisers, remaining in the court of of the great Seljuk Sultan Malik Shah and his famous wazir, Nizam ul Mulk, for at least six years. Ghazali proclaimed that the Abbasid Caliph’s ability to wage war and defend Islam was supplied by the Seljuks: ‘the requisites for the Imamate exists in Mustazhir billah…through the power [Shauka] of the Turks’. Moreover, Ghazali (and Imam Turtusi) famously supported Yusuf bin Tashfin of Al-Murabitun (‘Almoravids’). Tashfin was a Berber leader who publicly declared his allegiance to the Abbasid Caliph, and conquered parts of West Africa, Morocco and the Taifa states of Al-Andalus. Ghazali’s ‘movements’ for re-unification were, quite simply, the Seljuks and the Al-Murabitun – who he and other scholars actively supported. In his ‘Mustazhiri’, as already mentioned, Ghazali proudly called the Abbasid Caliphate ‘our conquering state’. Ghazali, in his fatwa to al Andalus, commanded the Muslims of al-Andalus to fight the Muslim (rebel) Taifa states who refused to submit to the Abbasid Caliph and his deputy Yusuf bin Tashfin, arguing that ‘one of the greatest forms of worship is to fight them’, until they return to obedience to the Caliph. However, with the Spanish Crusader kingdoms he did not advocate giving them the same reprieve as the rebels. Of course, this is not the only occasion where Ghazali issues rulings on taking up arms. Going back to his book ‘Al Mustazhiri’, Ghazali prescribes war against the followers of the Fatimids . So, to say that Ghazali never advocated, ruled or praised the taking up of arms, is plainly false. Ghazali believed in the Abbasid Caliphate enough to advocate for the defence of its territorial integrity and declare anyone who rejected or resisted it as rebels to be fought. MAL seems to be misleading his audience toward a meaning not in the text. Imam Ghazali clearly did not say it is Islamically permitted for Muslims to be ruled over by unIslamic law. The text simply makes an historical observation. Namely, if a government is consistent in applying its laws to all its citizens, the people will not accuse it of being unfair, and therefore they will not rise up in revolution (regardless of whether the culture or its creed is unIslamic or morally corrupt). This is consistent with the Prophet’s (saaw) teaching of previous nations being destroyed because if a rich man committed a crime, they would release him, but if a poor man committed a crime, they would punish him. Ghazali, was simply advising that the (Islamic) Sultan’s administration would not last long if he was not applying the Shariah consistently upon all his people – and if you read the full quote, Ghazali uses the example of the ‘Majus’ (i.e. the Persian Empire) who he argued had prevented revolutions by being fair in the application of their ‘Majusi’ law. In the book, Ghazali writes that Islamic ruler cannot breach the Sharia, and must command obedience to Allah (swt) and enforce prohibitions, he must discipline the people to obey God and practice virtue and people seeking claims against the ruler, must have the case referred to an Islamic court. It remains a mystery as to why MAL did not see fit to mention these words of Ghazali to his readers that were in the same book MAL selectively quoted from. MAL selectively quoting to his readers only one of Ghazali’s ‘ingredients’ (e.g. ‘justice’) for a good government over Muslims , but not mentioning the others, is like someone claiming that a cake can be made from just butter without adding any flour, eggs or sugar. Unfortunately, what you get is not a cake, just butter – at best, melted butter. It remains for readers to ask themselves whether any of these teachings by Imam Ghazali sound even remotely like a Secular government. ‘This ayat is sound evidence for having an Imam and khalif who is obeyed so that his word will unify [the Ummah], and the rulings of the Caliphate will carried out. None of the Imams of the Ummah disagree about the obligatory nature of having such a leader…When Abu Bakr died, he delegated the task of being Caliph to ‘Umar and no one said that it was not mandatory. Its obligatory nature indicates that it is one of the pillars of the deen which support the Muslims. Praise be to Allah, the Lord of the worlds’. Notice how Qurtubi argues that it being obligatory is an evidence for it being one of the pillars of Deen that supports the Muslims, rather than the other way round (i.e. he does not argue that the Caliphate is an invented obligation due to being seen as a useful utility for order). Firstly, no one claims that Ghazali considers a Caliphate to be a ‘religious ritual’. Strawman aside, what Imam Ghazali does start out saying, is that it is an Islamic obligation to have a Caliph (Imam) in every age – not just only in his time or the first century after the Prophet [saaw]. Ghazali then proceeds to mention the two main reasons: the first being the ijma of the Sahabah (consensus of the Prophet’s companions), and the second being that the Caliphate implements the societal laws of Islam in Quran and Sunnah, validating the officers in charge of implementing those Islamic laws, and ‘defends the Deen’ by uniting the strength of the Muslims in mutual defence. For the first reason, Imam Ghazali argues that the Sahabahs considered the obligation of Caliphate to be more important than a religious ritual – which was the burial of the Prophet Muhammed [saaw] no less! Imam Ghazali writes in his book ‘Iqtiqad’, a chapter titled‘On Showing that appointing an Imam is obligatory’, that ‘We should not think that this obligation derives from the intellect’, where he highlights the ‘the consensus of the Muslim Ummah’ and ‘the basis of this consensus’. Ghazali cites a hadith of the Prophet (saaw) to demonstrate that only the Imam of the Muslims, or his deputies, can legally apply the Islamic laws and rules. Therefore, Ghazali argues that without a Caliphate, the laws of Islam are inoperative, and no one would possess any legitimacy to implement them, or rule (including all political governors of all the regions). He also repeats this argument in his book ‘Iqtisad’ with the addition that all Muslims will be in sin(!). Imam Ghazali therefore writes: ‘the obligation of appointing an imam is among the essential requirements of the sharia [law] – a requirement that by no means can be ignored’. For more detailed arguments about the obligation of the Caliphate derived from the Quran and Sunnah, these can be read from Ghazali’s predecessor, Imam Mawardi, in his famous book ‘Akham ul Sultaniyyah’. Since Imam Ghazali believed in the Islamic obligation of the Caliphate in every age, it remains to be wondered how MAL could confidently claim that ‘there is categorically NO obligation in Islam to setup or work towards setting up an Islamic State/Caliphate’. The famous Maliki scholar, Imam Qurtubi [d1273] ‘clearly highlights’ the general understanding of the hadith that Muslims should have only have one ruler: ‘[The Prophet is narrated to have said]: “Whoever comes to you whilst your affairs are unified under a single person, seeking to undermine your unity or divide your ranks, execute him”…This is the strongest evidence prohibiting the establishment of two leaders. For this will lead to hypocrisy, dissension, schisms, civil strife and the removal of blessings’. In fact, Juwayni was careful to mention that only in extreme cases of distant lands that are cut off from the central Caliph, could there be a possible exception to the clear rule established by the Prophet Muhammed (saaw), and a second ‘Imam’ be appointed in a distant region. But he carefully and explicitly caveats that this second ‘Imam’ is not the supreme Imam of the Muslims. This exception-to-the-rule proves the general rule is mandatory outside of exceptional circumstances. The other scholars mentioned (but noticeably not quoted) by MAL, like Ibn Arafa (d.1401) ,Qalasadi (d. 1485), Sana’ani (d.1768), and Shawkani (d.1834) – do not dispute the general rule. For example, Ibn Arafa, who MAL chose to invoke, says: “If the position of the Imam is such that he can’t enforce his rule in distant areas, then it is permissible to install others [in those distant areas]” and Shawkani holds the same sentiment. Shawkani, also invoked by MAL, further reminds Muslims that the Muslim Ummah and its lands cannot be divided: ‘It is known from Islam by necessity that Islam has forbidden division amongst Muslims and the segregation of their land’. Despite those who believe an exception-to-the-rule is possible, Juwayni admits that the mainstream opinion of the scholars is that even if lands are impractically cut-off from the Caliph, even then that’s still no excuse to go against the explicit command of the Prophet’s hadith. Famous examples of this mainstream that rejected the exception-to-the rule are Mawardi , Nawawi , Sha’rani and Ibn Khaldun (see below). ‘It is not possible to appoint two men to the position (of imam) at the same time. The scholars generally are of this opinion, on the basis of certain hadith. Those hadith are found in the book, ‘On Leadership’ in the Sahih by Muslim . They clearly indicate that this is so. Others hold that (the prohibition against two imams) applies only to two imams in one area, or where they would be close to each other. When there are great distances and the imam is unable to control the farther region, it is permissible to set up another imam there to take care of public interests’. Importantly, concerning Ghazali’s opinion, what we should note from above, is that even in with the medieval transportation and communication methods of 1094, Ghazali noticeably did not consider Egypt or Al Andalus to be beyond the reach of the Abbasid Caliphate, which explains why he calls some of them rebels for not pledging allegiance to the Abbasid Caliph! Of course, with modern technology and transport (e.g. 16 hour plane trip from Lisbon to Jakarta), there would be no longer any room today to argue an exception to the general rule established by the hadith. What remains mysterious is why MAL would allege the scholars had opinions that were completely the opposite of their actual opinions. Perhaps he was (somehow) just honestly mistaken again. As mentioned already, Ghazali in his book ‘Mustazhiri’, as well as his later book ‘Iqtiqad’ , argued quite explicitly that all governors throughout all the regions of the world would become invalid without a Caliph. Considering that during the time of Ghazali, the regional governors were called ‘malik’ or ‘sultan’ had there own independent armies and administration systems, unlike the claims of MAL in his article, ‘might does not make right’ for Ghazali, but religious authority. In an online Q/A, MAL recommended to his viewers to refer to a video by Dr Jonathan Brown as an authority on the topic of a Caliphate. MAL said: “Islam does not ask for a Caliphate…for greater knowledge of this I would like to recommend you to…a lecture done by ustadh Jonathan Brown on the ‘myth of Universal Islamic state’, I’d refer you to that, that’s already been done in great detail” . We can only speculate as to why MAL would recommend a video of a lecture that contradicts his narrative about Ghazali. Perhaps the fact that the video is mis-titled, may be a reason. MAL’s use of the label ‘extremist’ against people who peacefully believe in the mainstream Islamic concept of a Caliphate, eerily parallels the same rhetoric used by former-Conservative Prime Minister David Cameron. MAL’s arguments also strangely parallel a section within a report commissioned by the notorious neo-conservative Henry Jackson Society (of whom Douglas Murray was a Director), which attacked the Islamic concept of the Caliphate with similar claims to MAL. Furthermore, Sara Khan, a Secular feminist in the UK involved in ‘counter-extremism’, who has worked closely with the then Home Secretary, MP Theresa May on promoting ‘British values’ also had praised MAL’s ‘CallEmOut’ campaign. Anyone who questions whether Ghazali’s position is merely the result of his political context (and not Islamic tradition), should therefore have to ask the same questions of the ‘political context’ of those rejecting the Islamic concept of the Caliphate too. Shockingly, Ghazali actually condemns MAL’s position: ‘[the Mutazilite] Ibn Al-Kaysan had entirely rejected the obligation of establishing Imamate…their position is extreme’. Therefore the belief that an Islamic Caliphate is not an obligation in Islam, is not only recent, it is extremist. As Muslims, our duty must be to denounce this extremism and #CallEmOut. ‘People shouldn’t be limited in their right to political ideology…That really plays into the hand of groups like ISIS. The key thing that leads people to support groups like that, is because that those groups call out hypocrisy of global systems, or of western dominated systems, so there’s the European countries that get together and say ‘we want the european union’, you can have NAFTA, you can have Irish americans who identify as Irish in someway and support Irish causes, and jewish americans who can support Israel, so everybody has an acknowledged right to some kind the notion of ‘confrere-ity’ [i.e fraternity] with others who they identify with across nations, who they identify with, you even have the right to supra-national unions of various sorts, and in fact there is already the organisation of Islamic co-operation. it is compulsory on the Emir and his party to fight those who are rebellious. More importantly they turn to their Christian mushrikeen allies [awliyaa] for aid- and they are the enemies of Allāh against the Muslims, who are the awliyaa of Allāh and one of the greatest forms of worship is to fight them until they return to the obedience of the just Emir who steadfastly obeys the Abbasid khilafa. ‘As long as they desist from disobedience [to the Imam] it is incumbent [upon] you to restrain from [fighting] them. If they fight [you], it is not allowed to pursue [them when] they take flight [flee the battle], nor to harm their wounded. But whenever their prowess declines and they are defeated then it is necessary to stop fighting them, and by that I mean the Muslims among them. This does not apply to the Christians who do not retain a covenant [from the Muslims]. The Muslims should not be preoccupied with fighting the Muslims’. ‘Al Bukhari: indicated it in a chapter entitled: “The people of each land sight it.” Others said that, when it is established among people that the people of a land have sighted it earlier, then they must make up any days they did not fast…. …Our scholars said, “The statement of Ibn ‘Abbas, ‘That is what the Messenger of Allah, may Allah bless him and grant him peace, commanded us to do’, is a clear statement that goes back to the command of the Prophet, may Allah bless him and grant him peace, and that is evidence that when the lands are far from each other as Syria is far from the hijaz, the people of each land must act according to their own sighting. If that is confirmed with the Caliph, he cannot impel people to follow him in that. But if he does, it is not permitted to oppose him.” The position of school of Malik regarding this question related by Ibn Wahb and Ibn al-Qasim in al-Majmu’a is that when the people of Basra saw the new moon of Ramadan and then news of it reached the people of Kufa, Madina and Yemen, they had to fast or make it up. Qays uI Abii Ishaq related from Ibn al-Majishiin that if it was confirmed at Basra as a generally known fact which does not require testimony and witnesses (because of the large number of people who had seen it) then it was obligatory for the people of other lands to make it up. If it was confirmed with the ruler only by the testimony of two witnesses then it was not obliged for other regions. It is only obliged for those under that ruler’s rule. But if it was confirmed with the Amir ul Mumineen, then the entire Ummah must make it up. That is the position of Malik’. Dr Jonathan’s Brown’s lecture was titled ‘A world-wide Caliphate?’, but the video was uploaded onto youtube titled as ‘the Myth of a universal Islamic State’, and widely circulated by Secular reformists – who appear to have been unaware of the full content of the video. In a recent article only a few days after MAL’s post, Sara Khan wrote that Secular Liberals ‘must push hard against Islamists’ and that they ‘must weed out the extremists in our midst who justify their beliefs in the “name of Islam.” As one scholar said last week, it’s time we #CallEmOut’. ‘When your Lord said to the angels, “I am putting a khalif on the earth”’ This ayat is sound evidence for having an Imam and khalif who is obeyed so that his word will unify [the Ummah], and the rulings of the Caliphate will carried out. None of the Imams of the Ummah disagree about the obligatory nature of having such a leader, except for what is related from al-Asamm (lit. the Deaf), who lived up to the meaning of his name and was indeed deaf to the Sharia, and those who take his position who say that the Caliphate is permitted rather than mandatory if the Ummah undertakes all their obligations on their own [e.g. like implementing the hudud] without the need for an Imam to enforce them. The Companions agreed to make Abu Bakr the Caliph after the disagreement which took place between the Muhajirin and the Ansar. If it had been a definite obligation that the ruler had to be from Quraysh, there would have been no point in the argument and debate which took place. When Abu Bakr died, he delegated the task of being khalif to ‘Umar and no one said that it was not mandatory. Its obligatory nature indicates that it is one of the pillars of the deen which support the Muslims. Praise be to Allah, the Lord of the worlds’. Excellent article, however, please do not concede to that most cunning of ideological attacks and frauds foisted on Muslims and the world by US hegemonist propaganda into believing that Daesh/ISIL/ISIS is a manifestation, a blowback of US foreign policy in the Middle East or a native Islamic movement. In a world where semantics are used to justify Western genocidal intervention, Daesh must be called out for what they are. It is not the result of US policy but IS US foreign policy in the Middle East (designed to provide the US with a new Bogeyman and a reason for military intervention as well as to create a repugnancy amongst Muslims for a true Caliphate with the adoption of graphic brutality as a modus operandi). are you stupid, im sure people like you believe they are israel dont you.